Background Electronic health records (EHRs) are transforming the way health care is delivered. They are central to improving the quality of patient care and have been attributed to making health care more accessible, reliable, and safe. However, in recent years, evidence suggests that specific features and functions of EHRs can introduce new, unanticipated patient safety concerns that can be mitigated by safe configuration practices. 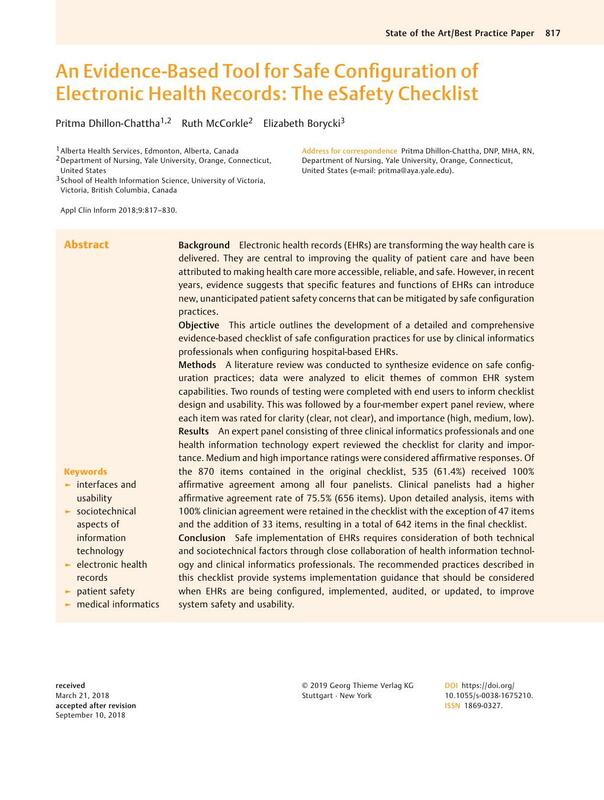 Objective This article outlines the development of a detailed and comprehensive evidence-based checklist of safe configuration practices for use by clinical informatics professionals when configuring hospital-based EHRs. Methods A literature review was conducted to synthesize evidence on safe configuration practices; data were analyzed to elicit themes of common EHR system capabilities. Two rounds of testing were completed with end users to inform checklist design and usability. This was followed by a four-member expert panel review, where each item was rated for clarity (clear, not clear), and importance (high, medium, low). Results An expert panel consisting of three clinical informatics professionals and one health information technology expert reviewed the checklist for clarity and importance. Medium and high importance ratings were considered affirmative responses. Of the 870 items contained in the original checklist, 535 (61.4%) received 100% affirmative agreement among all four panelists. Clinical panelists had a higher affirmative agreement rate of 75.5% (656 items). Upon detailed analysis, items with 100% clinician agreement were retained in the checklist with the exception of 47 items and the addition of 33 items, resulting in a total of 642 items in the final checklist. Conclusion Safe implementation of EHRs requires consideration of both technical and sociotechnical factors through close collaboration of health information technology and clinical informatics professionals. The recommended practices described in this checklist provide systems implementation guidance that should be considered when EHRs are being configured, implemented, audited, or updated, to improve system safety and usability. This quality improvement project was performed in compliance with the World Medical Association Declaration of Helsinki on Ethical Principles for Medical Research Involving Human Subjects, and was reviewed by the Yale Human Research Protection Program, and Alberta Innovates: A Project Ethics Community Consensus Initiative (ARECCI). The project was granted operational approval by Alberta Health Services (AHS) in accordance with applicable AHS quality improvement policies and procedures.